Who are Tom and Gary? Tom and Gary are two lifelong friends who invented the Decentralized Dance Party AKA The Party Revolution and have sworn to deliver it to Every Single Country On The Face Of The Earth. Their full inspirational bio and future aspirations can be beheld here. What is a Decentralized Dance Party (DDP)? The DDP is a portable, battery-powered Party System. It consists of hundreds of Party People, carrying boomboxes, and a DJ who wears a backpack, containing an FM radio transmitter. All the boomboxes are tuned into the DJ’s master FM broadcast, resulting in a mobile, synchronized sound system. This Portable Dance Party roams the night, generating complete awesomeness, street by street and block by block, onto buses and subways, into public fountains and beyond. Inevitably interfacing with the public, together we create an infectious epidemic of fun. A Roaming Party Adventure that lasts all night long! Participants become performers and inhibitions are overwhelmed as we all rise together in a chaotic and joyful monument to the Human Spirit. Together, we awaken the raw and beautiful rhythm and adventure-craving instincts ingrained in our DNA that have been subverted since childhood in our sterile western cultures and our collective energy projects everyone to unparalleled heights of happiness for hours on end. You will smile genuinely, you will make instant friends, you will lose yourself in the music and find yourself in situations so novel and thrilling that you will never forget them. The DDP is something that truly has to be experienced to be believed. The video below showcases the evolution of the Decentralized Dance Party- from 20 people to 20,000 in the span of six short months. And in the three years since, we’ve been Partying nonstop, throwing 44 more DDPs across North America during our Party Safari tours: Party Safari 2010 (Canada), Party Safari 2011 (Canada), Party Safari USA #1, Party Safari USA #2, Burning Man 2012 and Beyond. But what does “Decentralized” mean? It means that the Party has no Central audio source and no Central location. And how is this Open-Source? Are you Tom or Gary? If I have a moustache, I am Tom, if I am sporting a flat top, I am Gary. Does the Power Glove really control the music? Yes. The Power Glove can control the volume and skip tracks. It’s So Bad. Why is the Powerglove So Bad? The Unveiling Of The Powerglove was our generation’s moon landing. Will any portable stereo work with a Decentralized sound system? Any radio that can receive an FM signal will work, even your lowly alarm clock radio. How many boomboxes do you lose every Party? But when we toured the USA in 2012 people were way more respectful and on many of the nights we actually gained stereos because people were donating them. It also helped that we finally had all the technical problems of the past worked out. Does everyone need a boombox to participate in a DDP? No, only those who are cool enough to carry them. They can also be passed around. It only takes a few good boomboxes to ensure decent sound distribution. DDPs are hosted exclusively in public spaces and completely open and we take pride in creating the most inclusive Parties possible. Everyone of every Age, Background and Style is welcome to come out and let loose. People show up to DDPs with their kids and parents all the time. Homeless people join in. There’s nothing else like it. And it’s all good. The more diversity the better. Music is the Universal Human Language, dancing is the Universal Human Movement, and Partying is the Universal Human Release! That is currently being debated in progressive academic circles. We never had a good time at other people’s Parties because they were boring and we didn’t like the music they played. Then in 2006, Gary got his first ipod in a bank promotion and plugged it into an old boombox and we just started taking it everywhere and Partying all over Vancouver and having the best times. 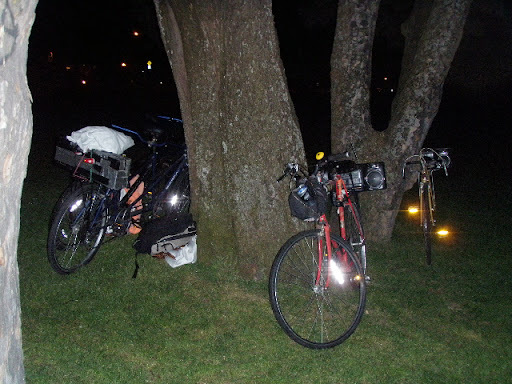 A few months later, a couple of us had boomboxes mounted on our bikes, playing tunes from our ipods. We were Partying. But when the ipods both died, we tuned our boomboxes into the same radio station.. and the effect of a mobile, Decentralized sound system was very cool. So we decided to get our own transmitter, tune in hundreds of boomboxes, and create the craziest Parties possible. It wasn’t until 2009, however, that we finally got down to business and invested the time and money necessary to bring the DDP to life. Have you considered other applications of your Decentralized Sound System? We would like to use our system as a PA for a band to perform a live show in an unusual/risky/hilarious location. Our candidates of choice would be HORSE the band, Tom Green, Dying Fetus, or Andrew W.K. Let them know please. The DSS is extremely resilient and extremely effective and 20 boomboxes can easily transmit music or voice to a crowd of 500. It is infinitely scalable, completely portable and can also be rigged to broadcast silently through headphones when noise regulations are an issue. All of the equipment is compact, inexpensive and readily available. For these reasons, Gary once proposed that Decentralized Sound Systems would be a great asset to the Occupy movement. DDPs look like a lot of fun. How can I participate? Join our Mailing List, Facebook and Twitter to receive information on upcoming events. What’s up with the Party Safari? We‘ve now thrown over 60 DDPs across North America, including: Party Safari 2010 (Canada), Party Safari 2011 (Canada), Party Safari USA #1, Party Safari USA #2. Our sights are now set on The Rest Of The World. “Of the People, By the People, For the People” has always been our mantra and thusly we’ve crowdfunded every single stop of every single Party Safari from day one. And our goal is to continue on in this manner, in order to maintain the integrity of this project. Although the crowdfunding route has been incredibly challenging, and we could easily have funded everything if we’d sought sponsorships with an energy drink company, or some other thing that has nothing to do with the DDP, we chose not to. Instead of polluting our Parties with the banners and logos of extraneous corporate sponsors, we distribute signs that simply say “Fun” on them. And creating The Most Fun Humanly Possible has continued to remain the sole objective. This has allowed us to maintain our dignity and enjoy complete creative control and have No Limits. And it also means that Tom and Gary are both heavily in debt. We do it because we like to feel alive. Sharing the music we love in an adventurous atmosphere with close friends and complete strangers makes us very happy. And we’re stoked to be at the forefront of a crazy new movement that inspires people to come together and “Forget Who They Are While Remembering What They Are”. This is further elaborated upon in The Party Manifesto. I really like what you guys are doing and want to support this.. do you accept donations? We do and we’d really appreciate it, as it costs a lot of money to keep going. What is Four Brothers’ Pizza? What is Booty Bass and Jock Jams and Eurodance? It is hands-down the best Party music of all time and formed a significant part of Tom and Gary’s musical upbringing. It is all we usually play, besides Andrew W.K. But towards the end of the night we always play Choice Hard Rock, like Van Halen and Journey and Meatloaf and Bon Jovi. And you seriously listen to that stuff? We truly love it and do not suffer embarrassment. Do you ever have problems with the police? We have thrown 60 insane Parties across North America, and the participants often numbered in the thousands. There was generally a small police presence keeping an eye on things, but no drinking tickets, fights or any other problems one would expect from such large, wild crowds. That is because the prime objective at a DDP is celebrating life, enjoying music and having fun- not getting drunk and being an idiot. More than a Party, the DDP has also been a very interesting social experiment; clearly demonstrating that thousands of people of all ages, cultures and social groups can come together to celebrate life and get crazy in our public spaces without causing any trouble. That is why the DDP is also known as “The Party Revolution”. It is a unique force that has the power to unify and inspire the people in ways never before imagined. Accordingly, we plan to take the DDP to Every Single Country On The Face Of The Earth and inspire as many people as possible to create their own DDPs and ensure that this becomes an enduring global movement that touches as many lives as possible. Once that is complete, we will host a Simultaneous Global Dance Party, transmitted to everyone in the world at the same time. It will be fun. You are invited. This is further elaborated upon in The Global Party Pandemic. This was probably one of the single greatest experiences of my life, I have never seen anything like it. There is no way to describe the experience without actually being there, I know even the videos will not do it justice. Everyone had such an awesome time. I’m 19 and for the first time in my life (I know this is sad) I think the Regina Police Service actually gained the respect of the young people in attendance there tonight. Kudos to them. They didn’t ruin the fun for anybody by power tripping around young people like I’ve seen all too often in the past as a young person, we seem to get it the worst sometimes. My hat goes off to all of the stand up members of our police force who did an awesome job keeping us safe while allowing everyone to enjoy themselves tonight. Thanks. Should “Party” really be capitalized? As with any hallowed cultural institution, Yes. Hello DDP, Yes I have been a dj for many years, and was so pleasantly surprised to spontaneously join the DDP party on the streets of Toronto while celebrating Canada Day 2017 on it’s milestone 150th Birthday celebration . It’s hard to believe I have not heard of DDP before last night . Good vibes with an awesome mission. I, too, am interested in transmitter specs. It seems the one you guys use is more powerful and gets a better range than a generic, “play your ipod in the car” type. Roxcore FM-201 seems to be a popular choice in this matter. I second Phillip Whelan: Get that FM transmittor circuitry out there!!! Opensource means open source!!! Is there any intentions of releasing specs on the actual FM transmitters you use or are they just a generic FM transmitter? Releasing the HOWTO for making your own transmitters would really make this Open Source and would be awesome to see. Lolololol. That is crazy. That is a great idea. I only wish I had one of those little boomboxes though. I remember those from the 80’s! Yay. This is amazing! Which FM-Transmitter do you use? Am I just not seeing it on the website or have you not posted where the starting point for the Portland event is? Can’t wait, regardless! How do you choose which FM channel transmit on? Aren’t some used by emergency services and such? Because we got more support and higher numbers in both Ottawa and Yellowknife… but you never know, anything is possible…….! What kind of FM-Transmitter do you guys use? And what is your opinion on other people starting DDPs? Generally, when attending a themed Party, it is expected you participate. It’s more fun, and may help you achieve True Partying. What is your boombox of choice? I’ve noticed in the pictures, people dressed up…is that expected for party goers? Or is it only the event planners that dress up? Any more questions can be posted here, and will be answered here.